Attached below is a schematic diagram of twinkle light switch with adjustable frequency. It is using SCR (Silicon Controlled Rectifier) as switch. Twinkle light switch is often also referred as a flasher. This twinkle switch can be used to turn on and turn off light or twinkling light and used as lighting or decoration for party, entertainment, shop display, celebration, Christmas, New Year, etc.. Attention: the whole circuit is connected directly to the high voltage 220 VAC, do not touching the circuit when connected to high voltage grid. The design is simple yet very effective. This circuit has only two wires to connect, the first wire is connected to lamp (B), other wire is connected to the power grid 220 VAC via a fuse (F). High-voltage current will flow through the lamp (B), passing through the circuit, and out through the fuse (F). Circuit voltage is supplied directly by 220 VAC. Bulb and fuse help to protect circuit from high-voltage large current. The circuit can also work with 110 VAC grid, by replacing bulb with 110 VAC bulb. Maximum bulb wattage is about 100 watts. Bulb wattage is limited by SCR and diode maximum current. Video when testing the circuit can be seen on the article "Adjustable Twinkle Light Switch For 200 Watts Lamp”. For circuit with greater power up to 2200 watts can be read in the article "Adjustable High Power 2200 Watts Twinkle Light". That big power circuit can drive a flip-flop lamps arrangement, which is 2 set of lamps turn on and off alternately. It is actually a modification of the above circuit schematic. B = bulb, incandescent lamp 220 V with a maximum power of 200 watts. 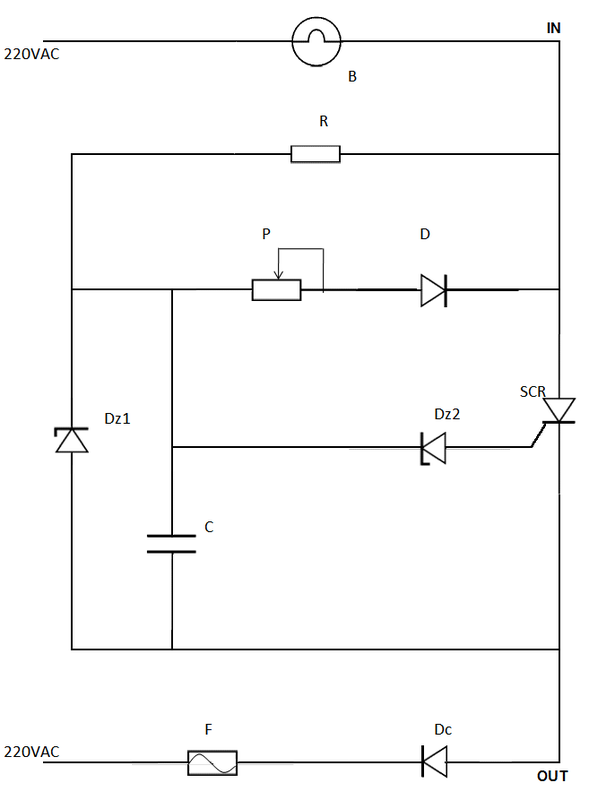 Lamp power is limited by the maximum allowed current of SCR and diode (Dc). This bulb may consist of several parallel-connected lamps. Eg 40 pieces of 5 watts incandescent lamps are connected parallel, and to be installed as a decoration for road gate. R = resistor, with rating of 56 kiloohms and 1 watt of power, serves to supply current to drive the circuit. P = potentiometer, 5 kiloohms 1 watt, can be tuned to adjust twinkle frequency. This potentiometer should be well insulated, because it will be adjusted when the circuit is connected to the high voltage grid. If using low-quality potentiometer with no good insulation, can cause high voltage electric shock to someone who adjust twinkle light frequency. D = Dc= diode, 1N4007, allow up to 1 ampere current at voltage up to 1000 volts. 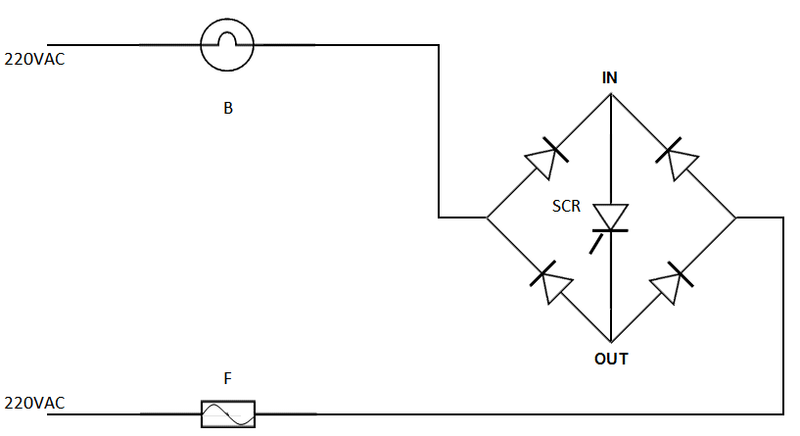 If you need to have more bulb power, for example 400 watts, then the current capacity of diode Dc at the output of SCR (cathode) should be risen, by replacing with a larger diode or 2 pieces of 1N4007 diode connected parallel. Diode on the cathode of SCR serves to ensure only the direct current that passes through the condenser (C), also protects the SCR from a high reverse voltage. While diode between potentiometer (P) and the SCR anode prevents high voltage into the condenser (C), but allow dischargin current from condenser (C) so that bulb (B) can be turned off after that bulb was on. Dz1 = 16 volts zener diode 1 watt, limiting the supply voltage to the condenser (C). C = condenser, 220 microfarads 25 volts, this condenser determines twinkle frequency. Bigger condenser means lower frequency, so smaller condenser means higher frequency. As maximum voltage supplied to condenser is 16 volts, condenser with a maximum voltage specification of 25 volts is sufficient. Dz2 = 6 volts 1 watt zener diode, determine the minimum value of condenser voltage in order to trigger the SCR, so that the SCR will connect and bulb will be turned on. When the voltage on the condenser is less than 6 volts, the SCR will be cut off and the bulb turned off. 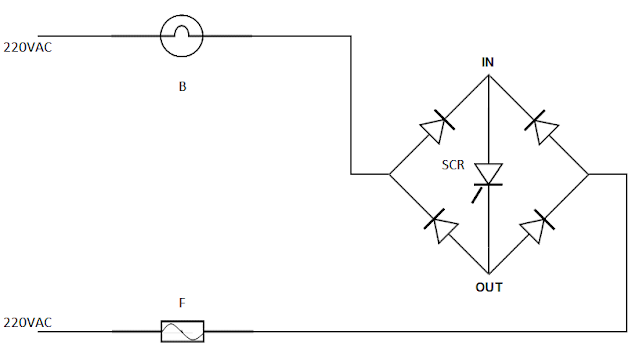 SCR = Silicon Controlled Rectifier or Thyristor, with code number CV12C, a diode that will only connect it’s anode to cathode when there is trigger voltage on the gate, or in other words it is a switch. This SCR has 2 amperes maximum current, but to be safe you should not exceed 1 ampere by not installing bulb (B) greater than 200 watts. CV12C datasheet can be downloaded here. Can also use other SCR such as 2P4M, data sheet can be downloaded here. For bulb (B) wattage up to 200 watts, SCR needs no additional heatsink. To make sure, check SCR temperature after working about 1 minute twinkling. Do not touch SCR unless both circuit wires are disconnected from hight voltage grid. Nothing heat also on cathode diode (Dc) for 200 watts load. F = fuse, rating is depending to bulb (B) power (amps = power: voltage), if you use a 200 watts bulb, the fuse current is 200: 220 = 0.9 amperes, can use 1 or 2 amperes fuse. Fuse can be slightly larger than that current calculation. Because when bulb is turning on, bulb is drawing more current then when bulb is steadily on. But if you put too big fuse, then it does not protect the circuit. The circuit can also be modified to become full wave, as below schematic. For beginners, please do not try the full wave circuit, as the electric shock would be more dangerous. Very little chance for body reflex to pull limb to escape from electrical shock. On half wave circuit, there is lag time when no high voltage, this is a chance for body reflex to pull limb from contact with electric from grid. As seen on full wave schematic, diode Dc is replaced by 4 diodes to form bridge. 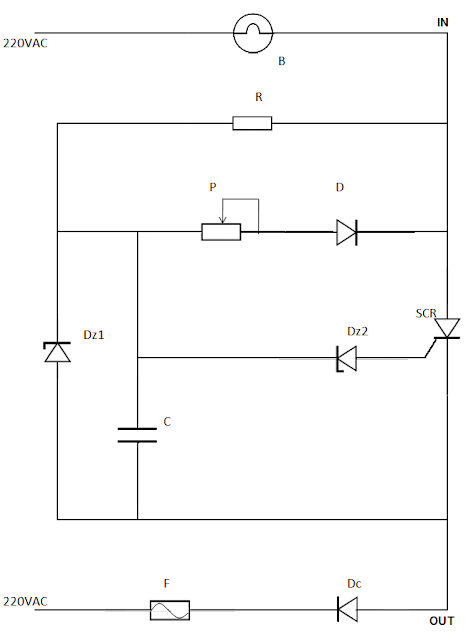 SCR circuit is similar to half wave. Note the IN and OUT points to connect bridge to SCR circuit. For safety, resistor R and zener Dz1 are replaced by 2 watts power capacity. Check if SCR needs heatsink. Twinkle frequency may change, so replace condenser C with a slightly bigger one to fit the desired frequency. I myself prefer the half circuit. Because it is simpler, safer, and makes the light seemed to vibrate as the effect of half wave.